One of the heaviest traveled eastern Iowa roads, that closed in mid-June because of flood damage, is back in business for the first time today. Steve Bellmer with the Iowa Department of Transportation says workers were forced to grade and repave a nearly one mile stretch of Iowa Highway 1 between Solon and Mount Vernon. "We had to remove quite a bit of pavement because it was undercut and there was a span of a couple hundred feed that was completely washed out," Bellmer said. "There was some granular shoulder we had to replace, but we also replaced a lot of it with concrete shoulder…hopefully to stabilize it and keep it from washing out later." A crew of workers started removing and replacing the pavement on July 11th. 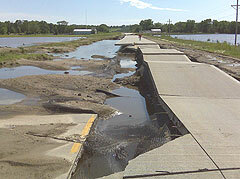 Bellmer says the project was a top priority since motorists were forced to use a 45 minute detour through Cedar Rapids. Bellmer says Highway 1 carries more than 5,000 vehicles per day. The contract for the project was for $547,000.